Dennis is reasonably well-known as a fly fisherman, thanks to a series of articles he has contributed to Trout & Salmon over the years, but although he is retired now, he is also known as the co-founder of Wychwood Tackle, at least two of whose drogues I have left hanging up on underwater obstacles over the years, so thank you, Derek. Trout From a Boat is one of those books which surely should have been written a long time ago, because it is a masterly treatise of a popular, but amazingly badly served subject. Sure, there are articles by the shed load in the mags every month, but space dictates that each deals with a tiny piece of the big picture and it is hard to gain an overall perspective – which is exactly what Trout From a Boat gives you, or what it would if it had had a tighter edit. I don’t want to put anyone off buying what I regard as the best book I have read to date on boat fishing, but the end result is rather like reading a series of magazine articles back to back. 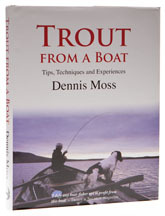 Dennis really knows his stuff and writes with authority about every kind of boat fishing you are likely to encounter in the UK and Ireland, but reading Trout From a Boat is a bit like fishing riffles and runs, because the stuff you want to read is diluted with lengthy stories that take forever to get to the point. So a second edition would be good – but even in its raw state, this first one beats the opposition into a corner, so perhaps we shouldn’t want to have our cake and eat it.